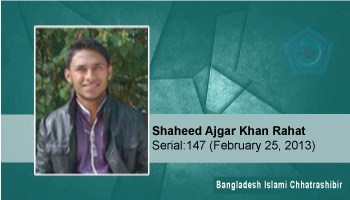 After the verdict against Allama Delwar Hossain Sayedee, on 15 February 2013, three people were martyred in a procession at Cox's Bazar. In light of this, protests were called on February 16 throughout the country. A student of Madan Mohan University College, Shibir member Ajgar Khan Rahat was seriously injured in police firing on that day. Later on, he was admitted to Apollo Hospital in Dhaka, where he attained martyrdom on February 25. Siblings: 3 brothers and 4 sisters. He was fourth.